The LAST MINUTE Corpus (LMC) is one of the rare examples of a corpus with naturalistic human-computer interactions. It offers richly annotated data from N total = 130 experiments in a number of modalities. In this paper we present results from various investigations with data from the LMC using several primary modalities, e.g. transcripts, audio, questionnaire data. We showed that sociodemographics (age, gender) have an influence on the global dialog success. Furthermore, distinct behavior during the initial phase of the experiment can be used to predict global dialog success during problem solving. Also, the influence of interventions on the dialog course was evaluated. Additionally, the importance of discourse particles as prosodic markers could be shown. Especially during critical dialog situations, the use of these markers is increasing. These markers are furthermore influenced by user characteristics. 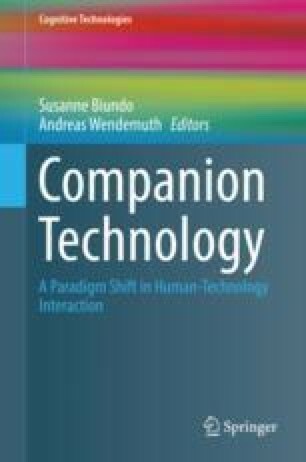 Thus, to enable future Companion-Systems to react appropriately to the user, these systems have to observe and monitor acoustic and dialogic markers and have to take into account the user’s characteristics, such as age, gender and personality traits. This work was done within the Transregional Collaborative Research Centre SFB/TRR 62 “Companion-Technology for Cognitive Technical Systems” funded by the German Research Foundation (DFG).